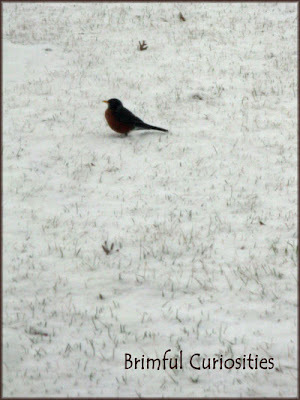 I'm afraid the poor robins in our area had an early April Fool's Day joke played on them this past weekend. Doesn't this one look a little annoyed, up to the top of its legs deep in the snow? I'm thinking it's going to take quite a bit of digging to find any worms under there. Our robins are getting very wet this morning! Ha!! We had some snow/sleet on Sunday, too. I'm not really welcoming it any more. I hope those birds can see green soon! Oh gosh! Poor Robins! You still have snow??? oh man - ours too - we had snow on Sun - but it has since melted! Poor robin. I feel just like him. I wish spring would just get here and stay. At first I wasn't sure if it was snow or sand. Hope the snow melts soon. Oh No!! Snow again???? Poor you! Poor birdie! I know how it feels. Great photo! People do associate Robins with spring. I guess he didn't count on snow. That is hysterical... Guess the robin was a little too optimistic. Poor little guy. Thanks for visiting my blog! Happy WW!